Last weekend I attended Conflux, Canberra’s speculative fiction convention for writers and fans. The theme this year was Red Fire Monkey, in line with the Chinese astrological year. Special guests were David Farland, writing instructor and author of the Runelords series, and Alan Baxter, author of the Alex Caine series. Sean Williams served as the Master of Ceremonies. As is always the case, there was a lot of good programming to see, so I had to split my report into two parts. The second part will be posted next Friday. Travel mug and Day One con loot. The convention began on Friday, 30 September. In the past, Conflux has dedicated the Friday to writing workshops. However, this year the programming took a different approach, running workshops and panels concurrently. This meant that panels began from 10 AM on the Friday. I got in nice and early to get registered. The con bags held a few lovely surprises, with books provided by Harper Collins. 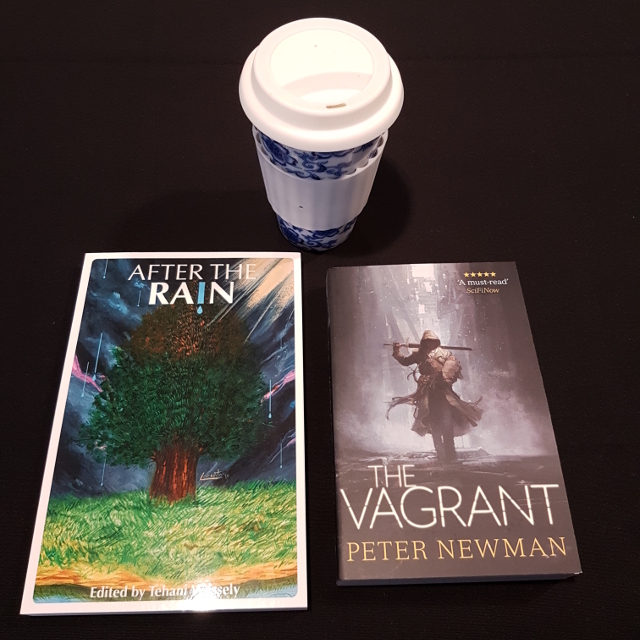 Mine held a copy of The Vagrant by Peter Newman. I was also one of the first 100 people through registration, which meant I also picked up a copy of After the Rain edited by Tehani Wessely and published by FableCroft Publishing. Being Canberra, it was appropriate that the very first panel I attended was on politics in SFF. James Hayman, Tracy Joyce and Gillian Polack discussed how they incorporated politics into their novels. Each was writing in quite a different genre–dystopian sci-fi, epic fantasy and literary fantasy respectively–but they all agreed on the importance of perspective. After all, no one believes they are evil and everyone has reasons for acting the way they do. Also, the point was raised that the writer’s politics are always present in a novel, just not always consciously. Guest of Honour David Farland gave several talks throughout the convention. His first was on writing best-sellers. He discussed some of the things best-sellers have in common and the importance of immersion. The best stories are the ones that take you to another time and place, therefore it is often harder for stories with a contemporary setting to become best-sellers. He also discussed the way Harry Potter was able to appeal to a wide audience by including characters of varying ages and telling their stories alongside Harry’s. And finally, he discussed the importance of using the right emotional draws for your audience, breaking this down by gender and age category. For me, the highlight of Friday’s panels was the panel on spec-fic romance, convened by Nicole Murphy. It was great to see a knowledgeable and respectful discussion, particularly since romance cops a lot of flack from other genres. Nicole also had some good advice on learning how to write about physical intimacy. This was one of the few panels I live-tweeted and you can see a bit of her advice in the thread. 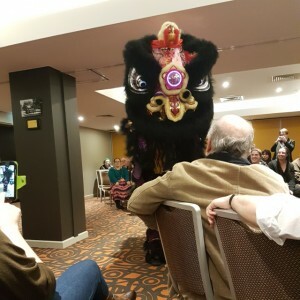 A Chinese Black Lion inspects the audience. Friday wrapped up with the Opening Ceremony. Our MC Sean Williams took us through the first moves of a new martial arts he’d developed with his Tai Chi class. Called Sci Chi, it included such moves as the Rimmer Salute, the Jedi Mind Trick and the Vulcan Salute & Nerve Pinch. A pair of Chinese lions then blessed the convention with luck and prosperity. Guest of Honour and Kung Fu instructor Alan Baxter provided some insightful commentary, thanks to his experience in teaching the dance. I was back early the next day to attend David Farland’s Guest of Honour interview with Tim Napper. The pair met when Tim was a finalist for the Writers of the Future contest, for which David Farland is a judge. David had won the competition himself some years ago and discussed the impact it had on his career, introducing him to authors such as Orson Scott Card. He also spoke about his experiences writing the Star Wars novel The Courtship of Princess Leia (as David Wolverton), after which he went on to write twelve Star Wars books for younger readers with Scholastic. He was also responsible for talking Scholastic into making Harry Potter their next big thing. Next week I will touch on a few more of the panels I attended. So stay tuned!